Basque Coast. The Cantabrian Sea in the background in a landscape with all the shades of green, rugged coasts of short estuaries, and mountains range of beech trees and oaks. It is probably one of the corners of Euskadi most photographed and universal. The Cantabrian Sea in the background in a landscape with all the shades of green, rugged coasts of short estuaries, and mountains range of beech trees and oaks. It is probably one of the corners of Euskadi most photographed and universal. Designed by North American architect Frank O. Gehry exhibition of contemporary art. © FMGB Guggenheim Museum Bilbao, Basque Country 2012. Erika Barahona Ede. Rights Reserved. Reproduction in whole or in part is prohibited. The Hanging Bridge in Bilbao is the best legacy of a past of mining industry, steel and industrial and port activity in the Basque Country. World Heritage Site by UNESCO. La Concha Beach is a beach located in the Bay of La Concha in the city of San Sebastian. It is one of the most famous urban beaches throughout the country. 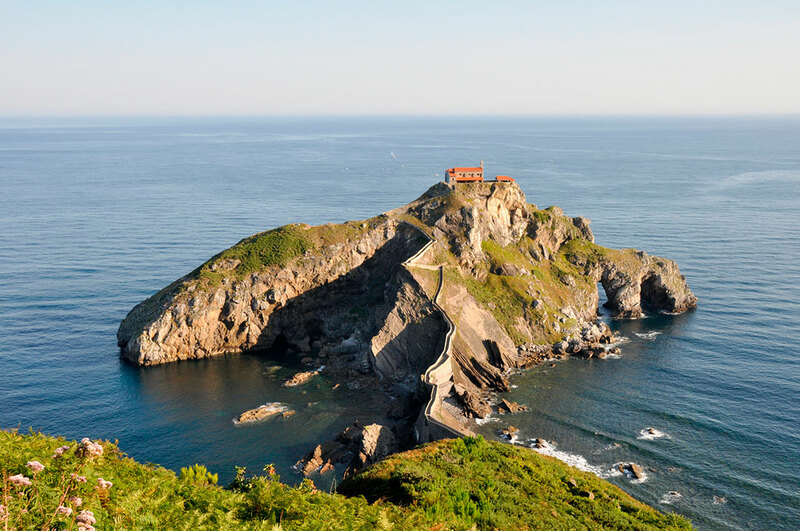 There are three sculptures that are located at the end of the beach of Ondareta in San Sebastian, the sculptor Eduardo Chillida made them, this work was created in 1977 and has become with the years in the emblem of the city. Located in the city of Vitoria -Gasteiz. Sure you have seen many gothic cathedrals, but never in this way. We propose you a new experience: discover how to work to restore a building of the XIII century. In order to renew one of the oldest wineries in the area creating a new identity, the Inheritors of Marques De Riscal entrust to the famous architect Frank O. Gehry. Gastronomy is an inescapable point and you can enjoy taking pintxos with all their creative combinations. For many years the basque cuisine has been considered indisputably the best in Spain. We have the best beaches of the Cantabrian coastline for surfing all year round. The Basque coast by its brave sea and its wide beaches are ideal for this sport. There are many specialized schools for all levels. Location of campsites in the Basque Country. You can access to the information of the establishments via this map. note. Placing the pointer over the marks you get more information. With this tool you can search for a particular campsite or obtain a list of campsites of one province. Consult here the offers published by establishments.